.London headlines this week’s new top level domain name releases. 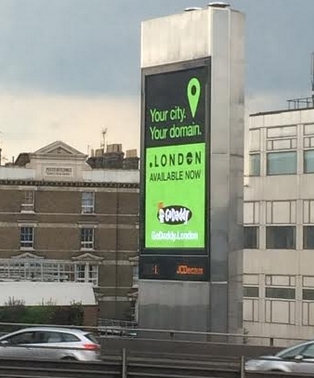 A GoDaddy advertisement in London for .London. One of the most-watched TLDs on the docket is launching this week as .London goes into general availability on Tuesday. Based on registrations during the priority period, this domain should do well out of the gate. The domain name is open to everyone; you don’t have to live or work in London to register a .London domain name. Expect to pay about $50 for a one year registration. Also on Tuesday, .global enters general availability. .Global has spent a bit on marketing and PR, but I can’t imagine it getting many registrations at $70+ a pop. On Wednesday, popular Chinese site RenRen.com will launch .ren. As best I can tell (from the application and a Google translation of nic.ren), the domains will be offered to the public on a restricted basis. It will basically become an added service for RenRen users. Also on Wednesday, 4 Donuts domains will exit EAP with regular pricing and four more will enter the 7 day phase. Reverting to regular pricing are .digital, .accountants, .finance and .insure. Entering EAP are .loans, .life, .guide and .church. I’ll be curious to watch .church over time. Churches are slow technology adopters, but there sure are a lot of them. Is .xyz’s marketing wrong, smart or both?